Back in the olden days (c. 1996) we used a reliable and effective tool for client and task management – the Weekly Team Meeting. New Web updates and long-term projects were listed on a whiteboard and reviewed every Monday morning. Our office administrator (Hi Jan, Suzi and Sue – wherever you are now) moved the tasks smoothly from “Awaiting brief” to “Complete”. Paper-based systems kept clients up to date, and the weekly meeting was the core. It was pivotal in our successfully gaining proper quality credentials: initially ISO9001 and subsequently Investors in People certifications. Now we are a looser outfit. Denisz and Kat work mainly from home. Paul comes into the office when required. And Simon has his own graphics studio, collecting his design brief over a cup of coffee in the office. Luckily the technology has improved to deal with today’s agile, diverse and distributed organisations. We’ve trialled quite a few Cloud apps to maintain the discipline that clients expect, whilst remaining responsive to their needs. Microsoft – MS Project is too “corporate”, designed for large projects. Outlook not collaborative enough. Microsoft Teams, Planner, ToDo seem somewhat disjointed but may coalesce into what we need. 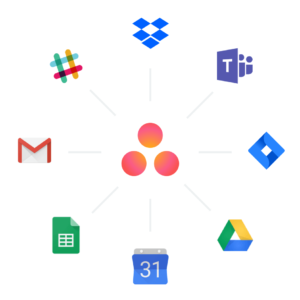 In the next post, I’ll go into more details about how we use Asana and give some tips on integrating with existing productivity software. This entry was posted in Teamwork and tagged task management, teamwork. Bookmark the permalink.